of all shapes, sizes, and colors are in the garden centers in my neck of the woods. Cinderella is the name of a pumpkin variety, but, for me, a cinderella pumpkin is any pumpkin with a fairytale shape, or with a bewitching stem, or with a magical color. Like the pumpkin sitting on my kitchen counter nestled in a green boxwood wreath... which happens to be a Rascal variety. For me, it is still a cinderella pumpkin. Just look at the color, the texture, the shape, and its crowning glory, the stem. 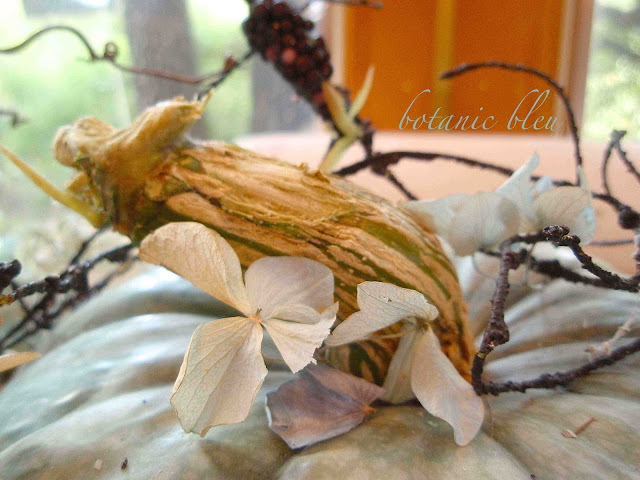 Any wondrous pumpkin with this much style and beauty could be transformed to Cinderella's carriage. So, what are the tips in displaying a Cinderella Pumpkin just waiting for its debut at the Ball? 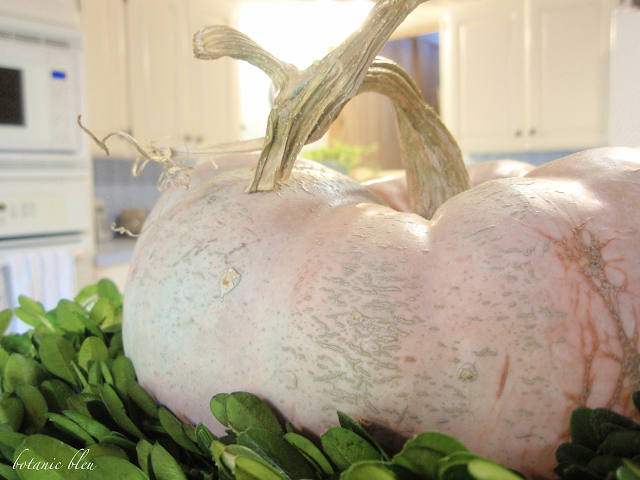 Rascal pumpkins are soft peach with hints of green in color and have delicate veined skins with texture. The color is really described as pink in growers' descriptions. Now, if pink is not a color for Cinderella's pumpkin, what is? I wandered around my local garden center for at least an hour finding just the pumpkin to bring home. Color was the first thing I noticed in ALL of the many choices of pumpkins. I looked long and hard at the white pumpkins, but there just was not a bewitching stem on any of the white pumpkins. Hmmm... maybe the wicked stepmother got there before I did and snatched up the beautiful white pumpkin with its bewitching stem. Curly stems with squiggly tendrils add beguiling features to even the most beautiful pumpkin, similar to curls and stray tendrils in Cinderella's beautiful hair coiffed for the ball. Shapely symmetrical lobes with a well-defined stem valley are a fairytale shape. Misshapen, tilting, lop-sided pumpkins may be good for cooking, but pumpkins destined for display should have more grace and style, especially if the pumpkin is a centerpiece by itself, not part of a clustered group. 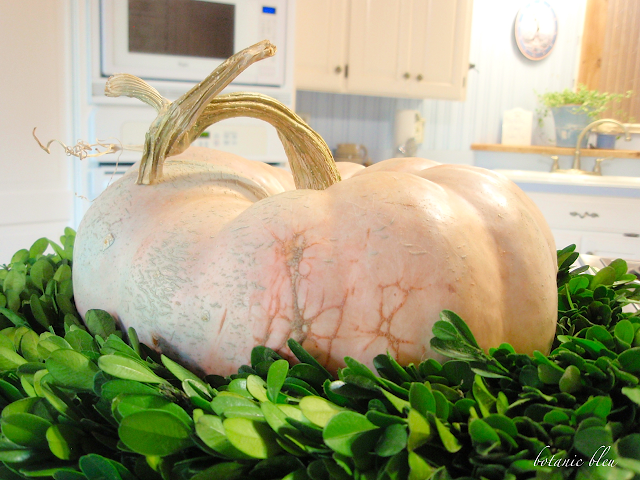 A Cinderella Pumpkin holds center stage by itself without need of ladies-in-waiting. A white pedestal cake plate with a ruffled edge showcases whatever sits atop it. Setting a pumpkin on a striking platter, in a rustic basket, inside a stoneware soup tureen, or in a tarnished silver loving cup draws the eye even more to the pumpkin. Look around your house, and use a container you like that fits your overall style. French Country is what I consider my style, and the white stoneware cake plate seems to fit French Country. Or, be bold, and use a totally unexpected container like a wooden crate, olive bucket, old wooden ice cream freezer, or a wooden Coca-cola crate. 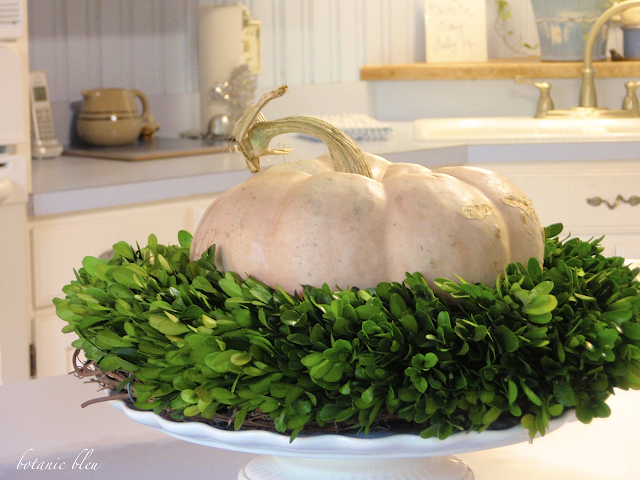 A preserved green boxwood wreath is a surprise for Fall. 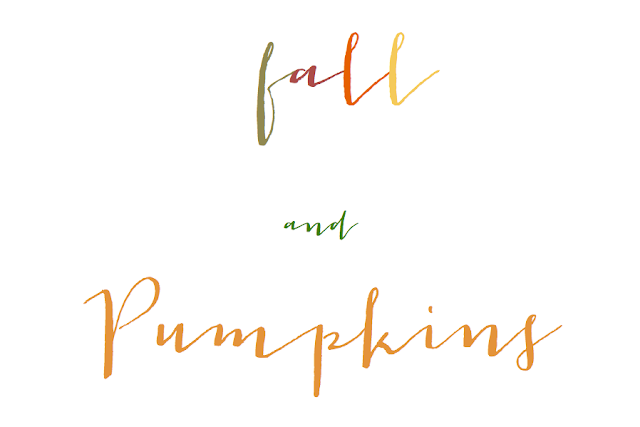 Traditional Fall colors are not my favorite palette so I look for things that are some of my favorite things to use all year and use them in Fall displays. 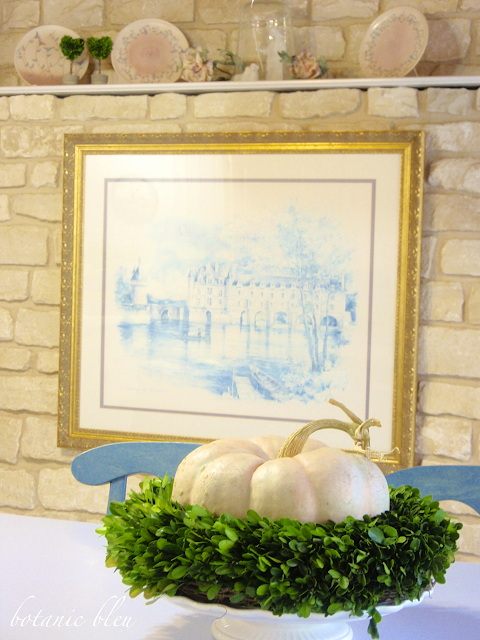 The boxwood wreath also gives a more formal French touch and less cluttered look to the arrangement. I have been trying to find ways to give a natural, airy look to my house. 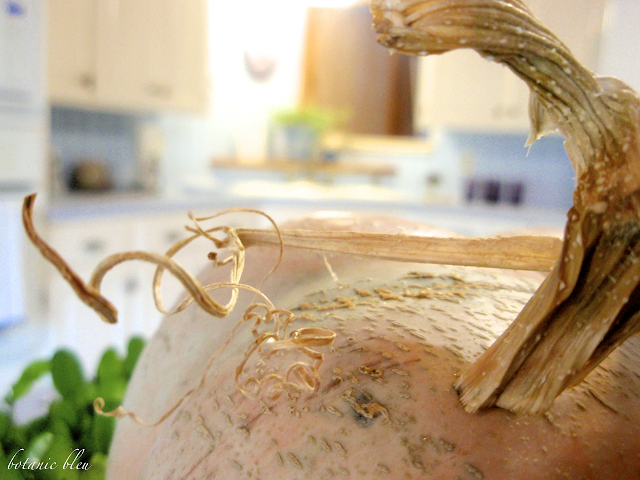 A nestling layer helps stabilize a wobbly pumpkin and camouflage any imperfections in the fairytale shape. No one is the wiser. Nestling materials like hydrangeas, berry vines, and grapevine twirls also add more interest to a display. 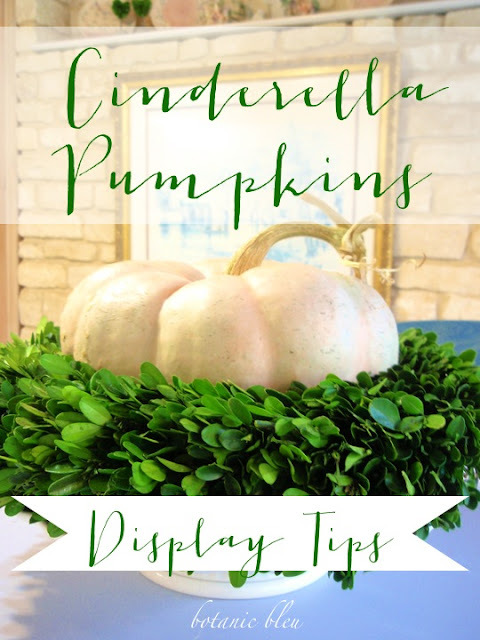 For more Cinderella Pumpkin displays, see older posts from previous years' pumpkins. See if you can spot how I used my five (5) tips in each of them. Your displays are beautiful Judith, and the color is perfect in your home making a perfect match to the stone walls. I have a friend who grows them year after year and there is nothing like wild stems attached. Judith, this is definitely a royal setting. 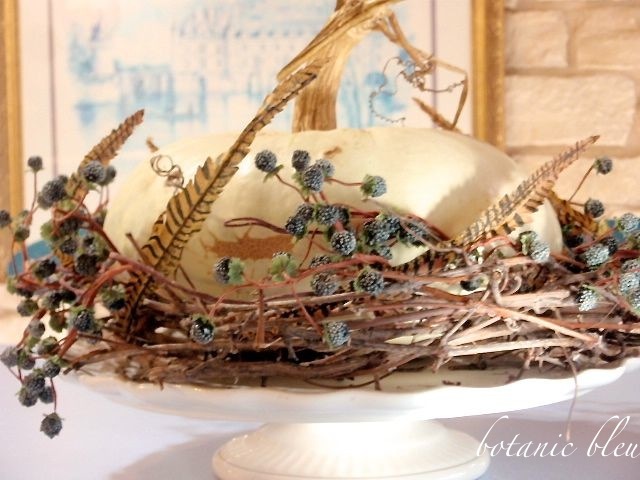 Love the idea of using a cake stand and the boxwood wreath. I frequently use a grapevine wreath and add in bittersweet or some other natural material. I have two of the blue pumpkins and a large Cinderella in an orange a green mix. They are on the front porch for now. I'm slow to decide what I want to do this year, though I have placed my velvet pumpkins in a few vignettes. They each have a bewitching stem. 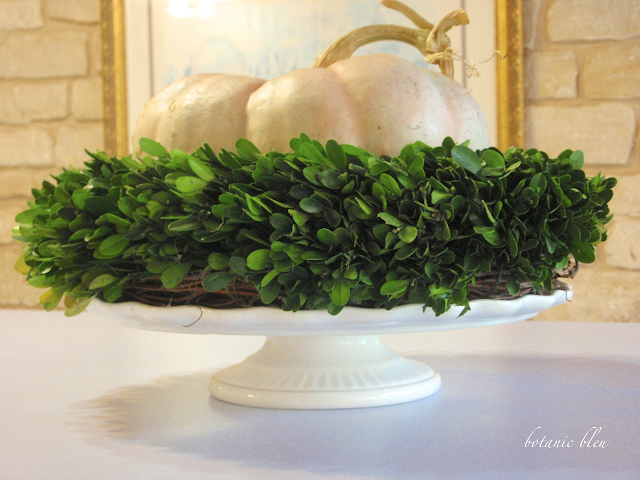 I have a new white pedestal plate and I am going to go out to look for the perfect pumpkin and a boxwood wreath. Love, love, love your pumpkin displays Judith! They are gorgeous!! 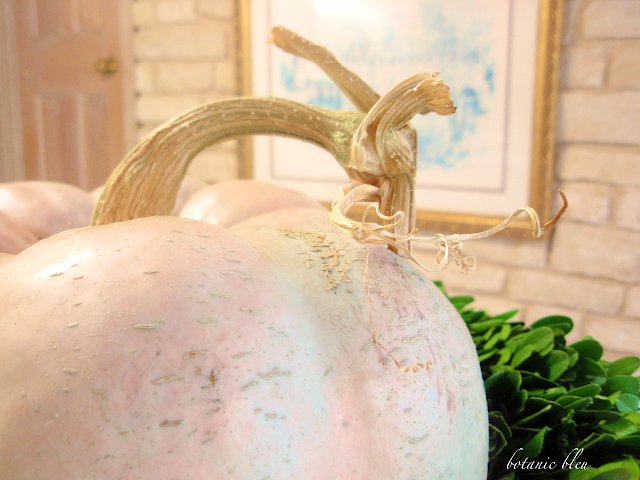 Cinderella pumpkins are my most favorite and I was so excited to see them in the stores this week. I have a few fake ones, but nothing beats the real thing! Absolutely gorgeous Cinderella Pumpkin, dear one!!! 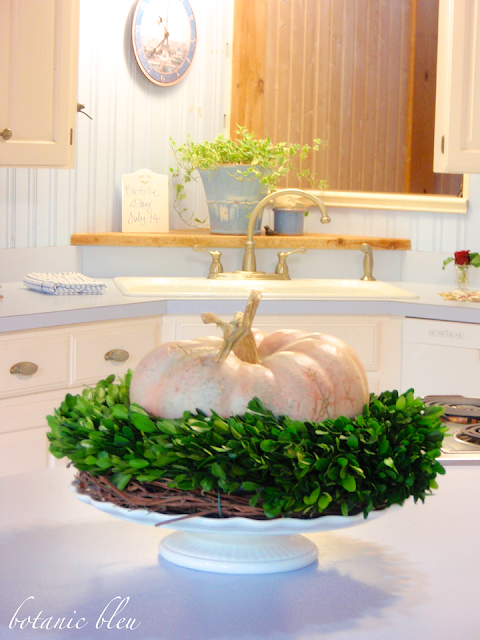 I adore how you've placed it atop a boxwood wreath!!! Elevation to a place of precedence is totally elegant!!! I just trimmed my boxwoods and was wondering what to do with all the gorgeous trimmings! You've totally inspired me! Thanks, it's gorgeous with your Cinderella pumpkin! What a great looking pumpkin! Thank for joining Home Sweet Home!